To begin with, this month the Auditor General’s report revealed how an estimated Shs50 billion meant for northern Uganda and Karamoja were instead used to facilitate “officers” who accompanied the Security Minister and visiting dignitaries for meetings at President Museveni’s upcountry home in Rwakitura. Shs. 2million was used to pay DSTV premium subscription and printer cartridge for Office of the Prime Minister on August 15 2011. And yet another Shs2m was used for telephone connection in the same office. A commission of inquiry into the mismanagement of the Global (and GAVI) Fund led by Justice James Ogoola established in 2005 that Mr. Muhwezi – along with two other health ministers, Mike Mukula and Alex Kamugisha – had cases to answer, including causing financial loss and uttering false statements. These ate Shs1.6 billion meant for treating pregnant mothers dying of malaria, for treating bed-ridden HIV/AIDS patients, for immunizing children against polio; Justice John Bosco Katutsi described them as beasts, rogues and a mass murderers for engaging in this competition. Some of this money has since been vomited. 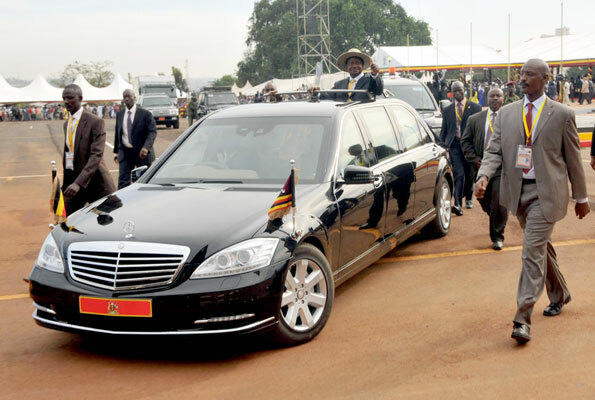 Ladies and gentlemen, the president of the Republic of Uganda has acquired himself new wheels worth 6billion. This kind of spending reminded the parliamentarians of their history 3 lesson about the reign of 17th Century French King, Louis XVI and his dear wife Maria Antoinette. According to police investigations recently, Mr Christopher Obey and Mr David Oloka, were accused of mismanaging the pension sector in the Ministry of Public Service, these two own several companies. The press reported that Mr Obey, basing on his personal estimation, is valued at Shs300 billion, close to a third of Uganda’s annual budget. A CID investigation said that the two eaters accumulated wealth in the pension scam that led to a loss of up to Shs169 billion paid to ghost pensioners. Foreign Affairs Minister Sam Kutesa and three other ministers, during the 2007 Commonwealth Heads of Government Meeting, took the eating to another level. They ate Shs14 billion. In preparing for Chogm, Hon. Kutesa was specifically responsible for arranging venues, accommodation, conferences and the secretariat. Kutesa (Honorable) had nothing to do with procuring vehicles. He instead usurped the role of the works and transport minister and spared no effort in ensuring that the contract of procuring Chogm vehicles is awarded to Motorcare Uganda, a company in which he once held shares. “The procurement process was fraudulent and marred with many irregularities,” concluded the Public Accounts Committee (PAC) Chogm Audit Report. But the same court on Friday, November this year of Jubilee acquitted and discharged the three accused ministers, saying that the prosecution had failed to make its case against them. The other contestants are Former ministers of internal affairs Minister Kirunda Kivejinja and Alintuma Nsambu who also actively participated. They didn’t spare the Shs200 billion that was meant for National Identity Cards. ← Thugs in Kampala: Who’s is in Charge? Pru, thanks alot … am in for a big vote n vote. twakowa. Reblogged this on Isaiah's tales.